Sydney had an unseasonable amount of fog set in yesterday. Standing at Central station you could barely see anything beyond the platforms, it was spooky. San Franciscans would laugh at our bewilderment, but Karl just doesn’t visit that often here. Clara and I had a close encounter with it from our flight from Tokyo. We were flying through clear sky, lined up with the runway, and we’d heard the landing gear deploy. Just as we we low enough to perceive individual buildings and cars, a blanket of what looked like thick cloud hugging the ground appeared. Next minute we were flying through it, and we couldn’t see anything. Perhaps the pilots suddenly couldn’t either, and out of an abundance of caution decided to abort the landing. We heard a sudden and deafening roar from the engines, and the nose pitched up. There were a few audible gasps from the cabin, and some worried faces. The lead flight attendant came on the PA and announced in Japanese and English that we were trying another landing. 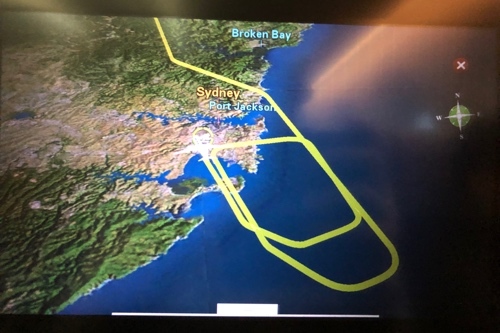 I’d assume Sydney Kingsford Smith would have ILS, but I still respected and admired the quick thinking of our pilots who decided they’d had insufficient time to prepare for this change in circumstances, and decided to re-attempt. That fog came from nowhere. Aborted takeoffs landings are uncommon, but not unusual. I only fly a half dozen times a year, but it was my first experience with one. Update: Thank you to the many, many of you who pointed out that whoops! Newer post ← Using a 4K LG UltraFine display with FreeBSD?